After much work and countless sleepless nights, we’re proud to finally be able to show you our latest non-fiction title, Divorce and a Strategy for Happiness: A Sinkholes and Ladders Book by Sarah Jacobs. Sarah lives near Nashville, Tennessee and came to us, believe it or not, through a writing group. We first read her material in fits and starts, a chapter at a time, pre-polish, and even then were blown away by the honesty and easy style in which she told her story. Sarah was a traditional homemaker — and by that, we mean she made pies, grocery shopped, and spent the rest of the day preparing her home for her family’s evening. She was raised in the Church of Christ, and as such, was dedicated to the idea of the submissive wife as a helpmate for her husband. She was comfortable in her role; she knew what she wanted, and built her life around her faith and her family. Fast forward almost thirty years, and after a marriage atom-bomb leaves her no choice, we find Sarah locking the door behind her and driving off into a Southern afternoon to parts unknown, with everything she owned thrown hastily into a truck. She didn’t know where she was going, what she would do (she’d never worked a single day outside the home), or where a forty-seven year old mother and wife goes to being scratching out a new, terrifying existence as a single woman. 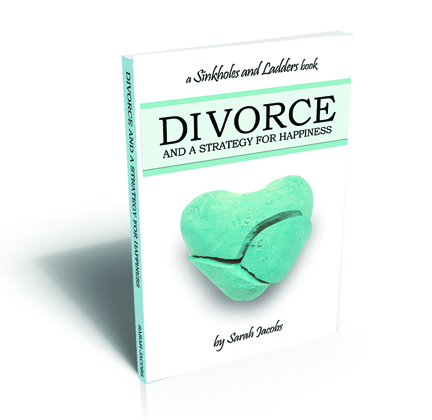 Divorce and a Strategy for Happiness: A Sinkholes and Ladders Book is the tenuous story from here to there. Fast forward a few years more, and Sarah is now an accomplished author, speaker, career-woman, and the member of many professional organizations. In her book, she shares her memories leading up to, through, and after her divorce, and the play-by-play strategies she used to create her brand new life out of thin air — and a lot of faith. Click here to buy the print version, here to buy the Kindle version, and here to read a free excerpt at the author’s website. 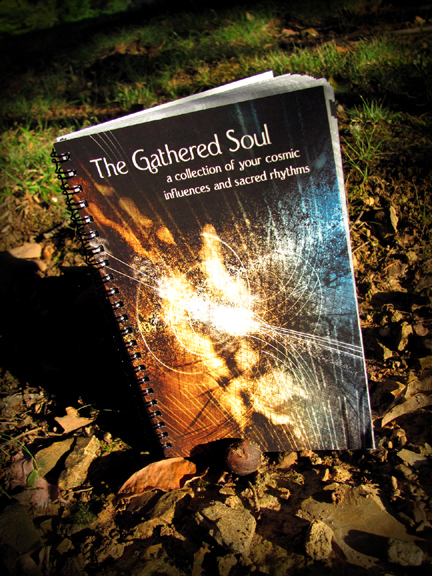 We’re happy to announce our latest title, The Gathered Soul: A Collection of Your Cosmic Influences and Sacred Rhythms. 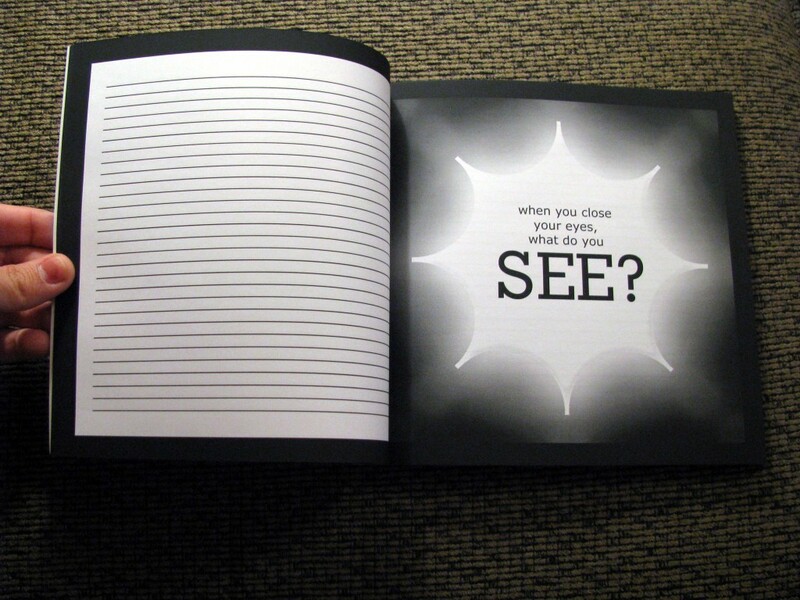 This esoteric journal is a bit different from all others we’ve seen around. 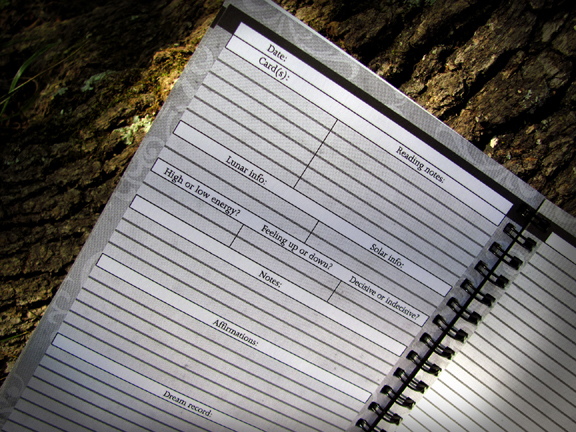 Inside, you’ll find write-in pages in which to record your dreams, affirmations, astrological or environmental cycles, cards, reading notes, mood, energy level, and anything else which applies to your spiritual life. The idea was brought to us by Cathy Lynn, a fellow writer and the owner of Cathy Lynn Tarot, and is the first in our forthcoming line of lifestyle journals. She looked long and hard for a single, portable book to use, but only found journals specifically intended for this or that. She felt limited and didn’t want to compromise. Frustrated with her options, she dreamed up the Gathered Soul — a book that covers all of those bases — and worked with Tracy Lucas to co-design a more malleable system of record. Each copy has room enough for ninety days, whether means using it daily, weekly, or just when you happen to feel like it. That’s the whole point; it’s your book, your way. We’re proud to deliver a spiritual journal that finally leaves room for you to include the things that matter to you (in any combination) and lets the others slide. And right now, for a limited time, there’s a pre-order sale on The Gathered Soul while we await access to the first public shipment. Take a look below, and if you like what you see, go ahead and order here! 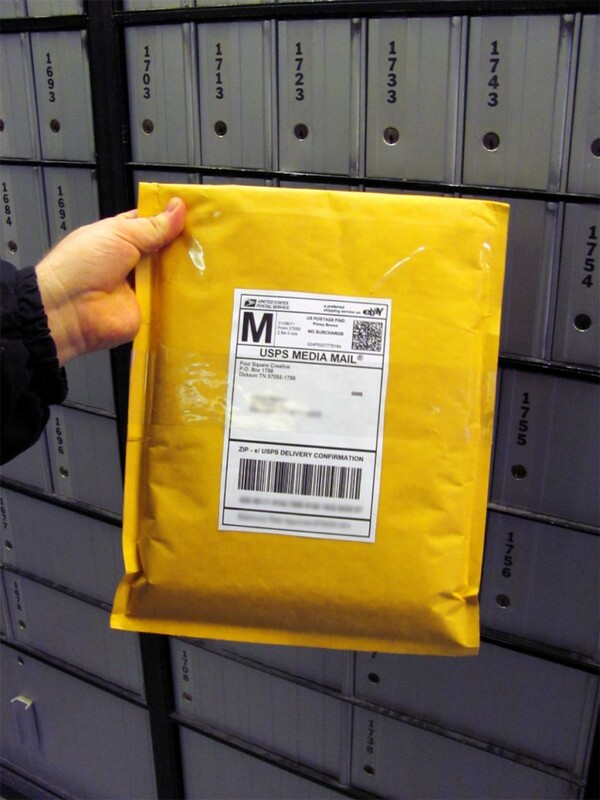 We received the first shipment, and found them to all be accounted for. Every book had a preorder already waiting for it. The good news is that we had exactly the number we needed and we’ve seen people have really respond to our new 52-week edition. Well, it’s not even bad. Let’s call it mixed news, because there’s a definite upside in it for you. So, since we’ve run into this pleasant surprise, we’re going to discount the retail price back down to the original $15 preorder price we offered temporarily in December. Once our next shipment comes in, the One Year Hook Book price will be raised again back to the $20 list price it usually sells for. We expect more OYHB copies within the next two weeks, and will ship any outstanding orders immediately upon receiving them. You guys have been fantastic, and we thank you. 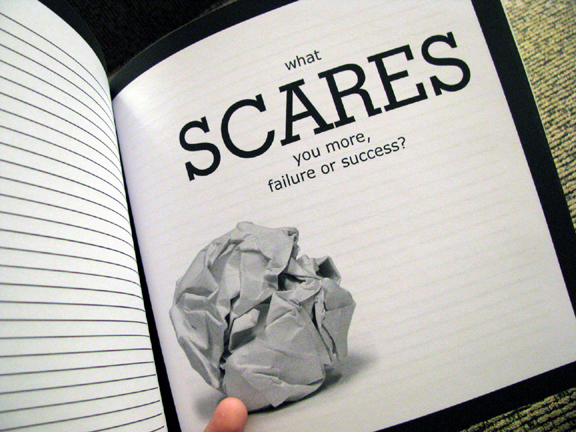 Let us know what you’ve done with your journals and what weird words fall out of them. We’d love to hear what you’ve created! Whoo-hoo! Exciting news in Smash Cake land. The women behind 3 Shared Paths, one of our favorite motivational blogs, have selected our One Year Hook Book as their book of the year. 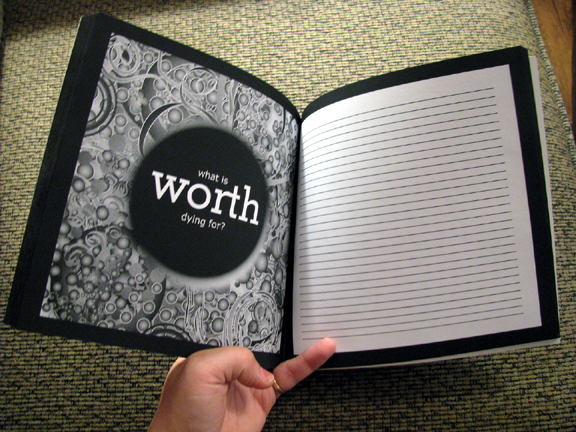 They will be working through our prompt journal during 2011 and sharing some of their thoughts as they go. With this site we hope to help people interested in finding new resources — books, practices, products — that might help them on the path of self-fulfillment and personal growth. 3 Shared Paths posts regularly about inner discovery, intentional living, and confidence, and we think it’s a perfect fit. So, then. Here’s to new starts and fresh goals! 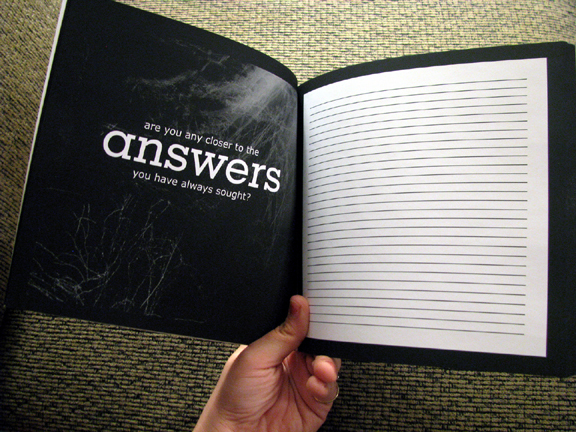 This fall, an idea came to us through a customer who asked us to produce a Hook Book with wire binding and enough prompts to keep going for a year. 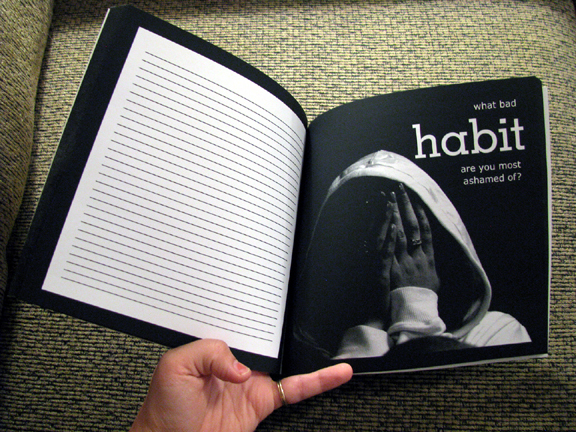 We’re calling it the One Year Hook Book: A Journal in 52 Prompts, and the first buyable copies will be printed during the first week of January and delivered immediately thereafter. If you preorder now, you will save 25% off the regular list price and be sure to get your copy while the new year is still in startup mode. 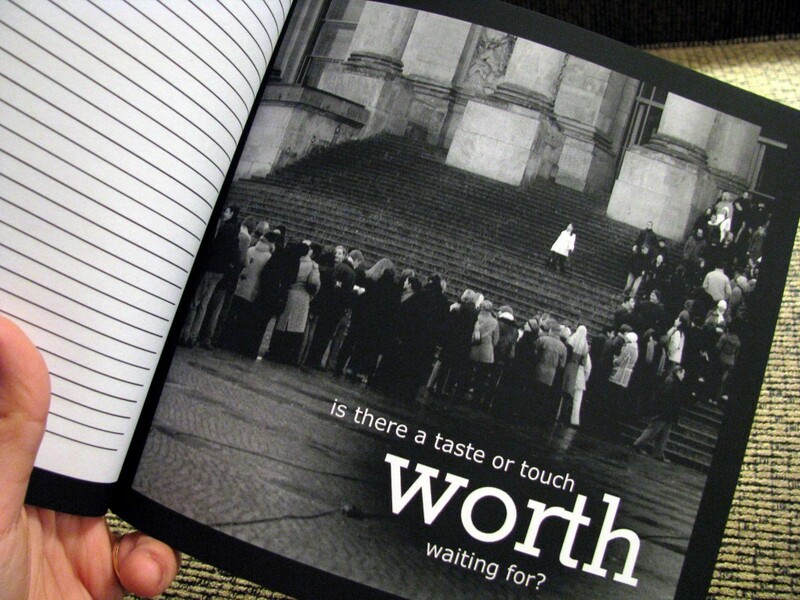 Wonder what our writing prompt journals look like in the real world? Yeah, we were hoping you did. Each of the images below are from the pages within Hook Book: Volume 2, available for purchase here. It’s 136 pages of gooey prompty goodness (we’re in the mood for holiday chocolate–can you tell?) and we only have a handful in stock left to ship before Christmas. We’ll have another shipment coming in January, but that’s obviously not going to help you out at a holiday party. If you want to give this as a present, now’s your chance. 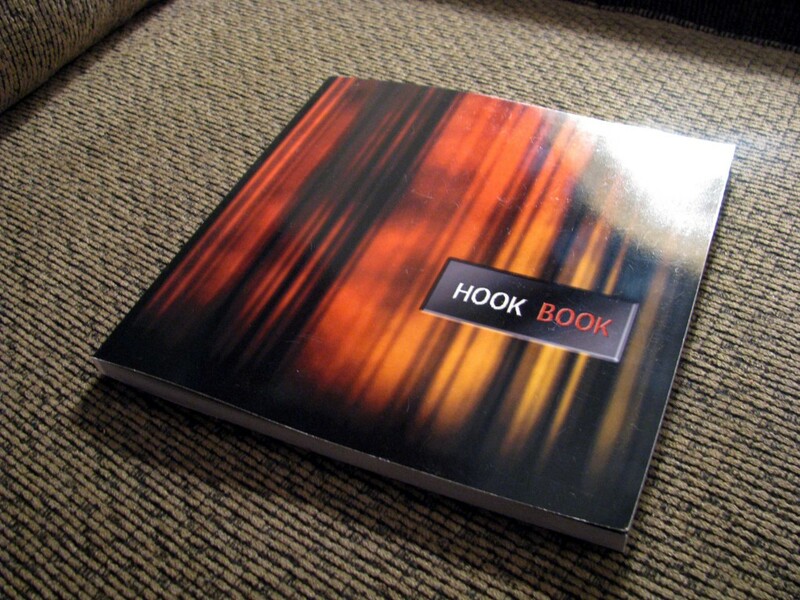 To see what’s in Hook Book: Volume 1, click here. To buy either, click here. 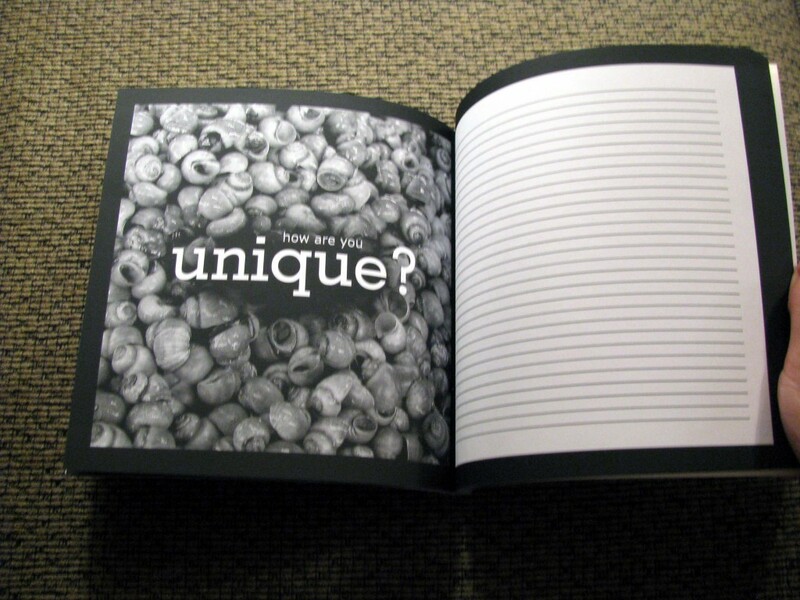 Several folks have written us asking what the interior page design looks like for our Hook Book Journals. We intend never to use the same prompt twice, even in new volumes. We wanted it to be sincere and wide-reaching, so as to stir you where the best secrets lie. We wanted it to be dark, beautiful, and usable. Now that we have our first shipment in hand already, we figured, hey, why not just snap a few pics and give you a peek? Each of the images below are from the pages within Hook Book: Volume 1, available for purchase here. 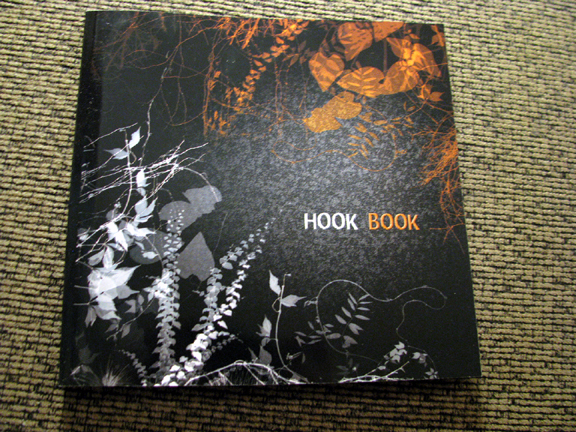 To see what’s in Hook Book: Volume 2, click here. 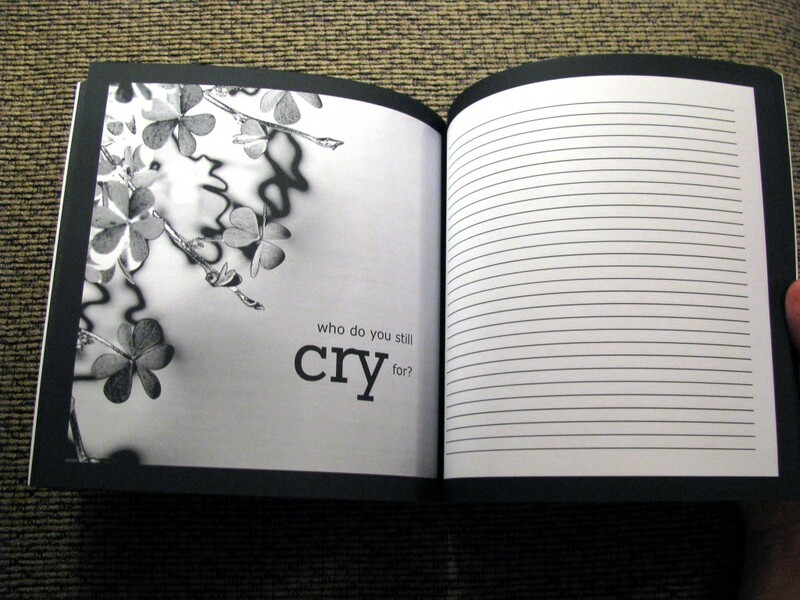 For those of you who’ve enjoyed our Hook Book Journals, good news! 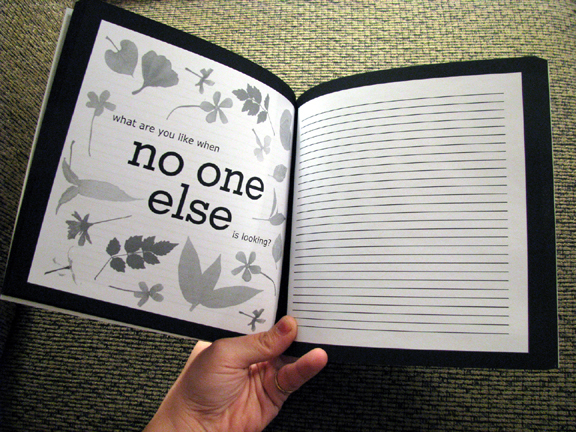 We are currently working on a yearbook in the same vein. 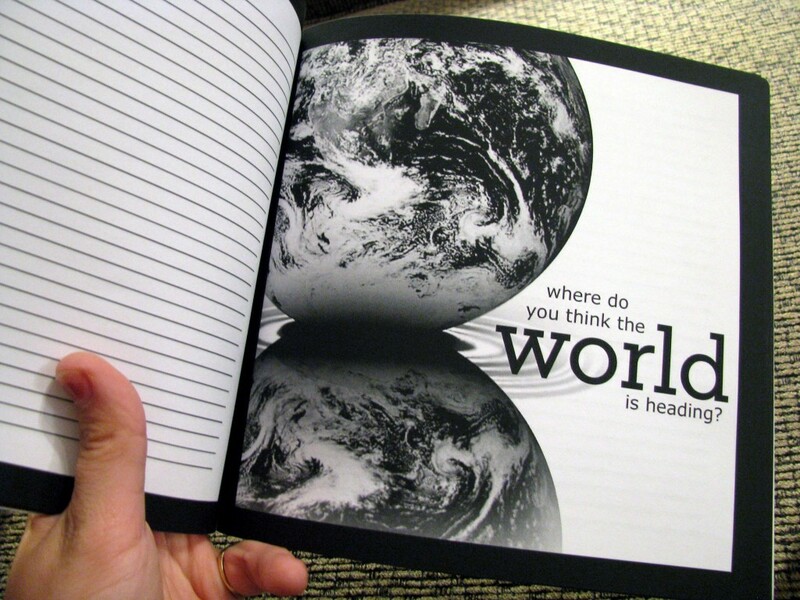 The prompts are all new material (they always are; we do our best never to repeat) and will be spiral bound and ready for 52 weeks of your best writing. 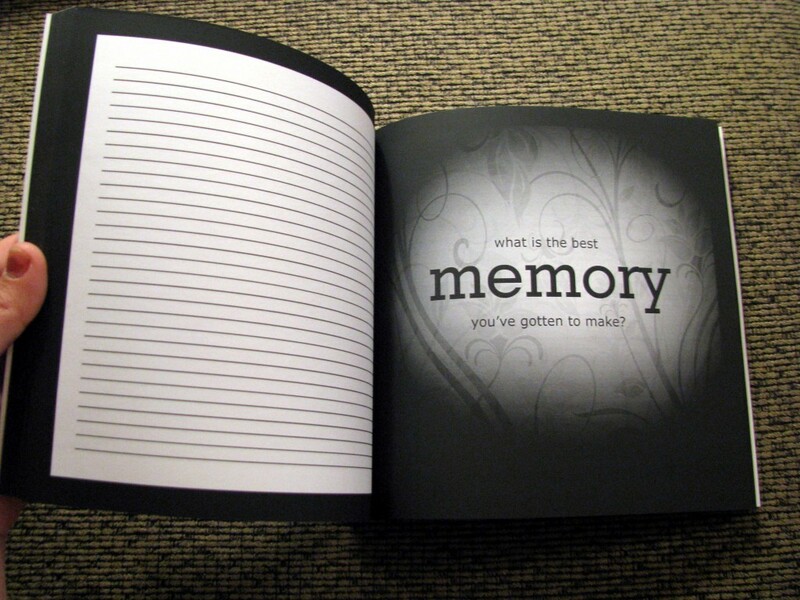 The new Hook Book 2011 Yearbook of Prompts will be out in mid-December, and if it proves popular, we’ll continue to offer a new calendar-journal each year. This is your chance to tell us what works, what doesn’t, and to be among the first to see our latest exciting product! Sales information, page count, and a sneak peek will be coming soon… watch this space for details. Yeah, we know. The blog is looking lonely. That’s because we’ve just started on the blog feature and are looking now for new content to bring you on a couple-of-times-a-week basis. We’ll review competitor’s books, bring you literary news and opinion, feature guests once in a while, and let you be the first to hear about our freebies, discounts, and contests. In the meantime, take a look around, click some stuff, and let us know what you think.